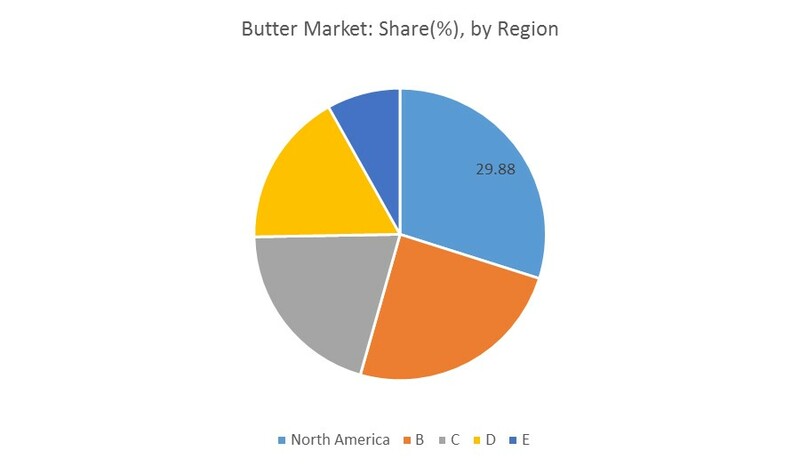 Home Industry Reports Food & Beverage Global Butter Market - Growth, Trends and Forecasts (2019 - 2024). The global butter market is expected to grow at a CAGR of 3.8% during the forecast period, 2018-2023. Butter is one of the vital ingredients of confectionary products. However, with the dropping prices of butter, the competition between substitute products has intensified. The demand for spreadable butter has been growing gradually in developing countries, as it is used in various food products. The increase in demand for natural products due to the rise in health consciousness drives the growth of this market. A rise in the disposable incomes, especially in the developing countries, is another driver of this market. In developed countries, product innovation and the increase in home-baking drive the butter market growth. Availability of healthy alternatives to butter, such as margarine, along with government regulations in the production and distribution of butter restrain the market growth. Growing demand in developing countries can be considered as an opportunity for butter market. The global butter market has been segmented on the basis of processing as: processed butter and non-processed butter. Processed butter holds a share of 56% in 2016. By type, the market is segmented into cultured butter, uncultured butter, cream and whipped butter, whey butter and salted butter. Regarding usage, the market has been segmented into spreadable and non-spreadable, wherein, the non-spreadable butter segment dominates the global market. The market is further segmented by the distribution channel into super markets/hyper markets, convenience stores, grocery stores and others. The super markets/hyper markets segment dominates the global market. The global butter market has been geographically segmented into North America, Europe, South America, Africa and Asia-Pacific, wherein, North America dominates the market. The United States is a major market in this region. The increase in home-baking and the growing food industry further support the growth in this region. However, Asia-Pacific is expected to be the fastest-growing market for butter, during the forecast period, with China and India being the major markets. Increasing disposable incomes and change in consumer preferences are the main reasons for the growth of butter market in Asia-Pacific. Introduction of new products is the main strategy of major companies, to increase their market share. The promotional campaigns that promote the usage of natural products have helped the companies to increase their sales. Market expansion in developing countries has created many opportunities for the manufacturers. Some of the prominent players in the global butter market include Amul, Arla Foods UK Plc., Kraft Foods, Inc., Frieslandcampina, Dean Foods Company, Farmers Cooperative Creamery, Land O Lakes, and Nestle SA. 7.2 Arla Foods UK Plc. 7.10 I Can't Believe It's Not Butter!